I love soul food and I love BBQ so it was only natural that I combine my two loves into a Slapilicious Collard Greens with Smoked Pig Shank which is great on its own or perfect to accompany your barbecue ribs. Add some Mac and Cheese, and you’ll have a memorable meal. For those of you who are fans of collard greens, you know that the secret to great flavor is to use a good stock base to cook your leafy vegetables. Common stocks for collard greens include those made from smoked turkey wings, turkey necks, ham hocks, ham, Kielbasa, or any other meat that you have handy. 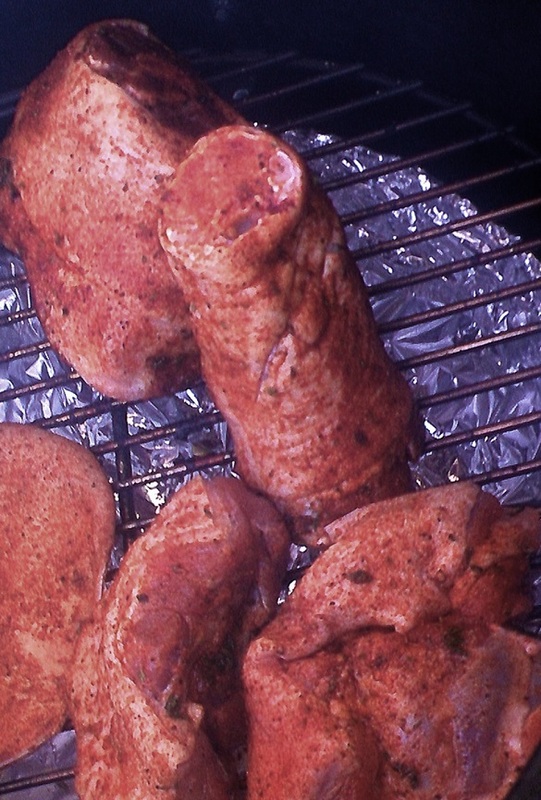 Whenever I barbecue, I like to toss pieces of pork shank (the front legs of the pig) onto my pit with some rub sprinkled on them. Once they are cooked, I cool and freeze them so whenever I need a flavorful stock base, I remove them from the freezer to use them. You can put them into a pot and cover with enough water to submerge the shanks and simmer for several hours until the shanks melt into a wonderful gelatinous stock. I like to add a chopped onion to give it a bit of sweetness to contrast the slight bitterness of the greens. If I’m smoking butts and brisket when I am doing this dish, I just put the shanks in a half foil pan with some water and leave the pan in the pit when I cook my long haul meats. Either way will work. 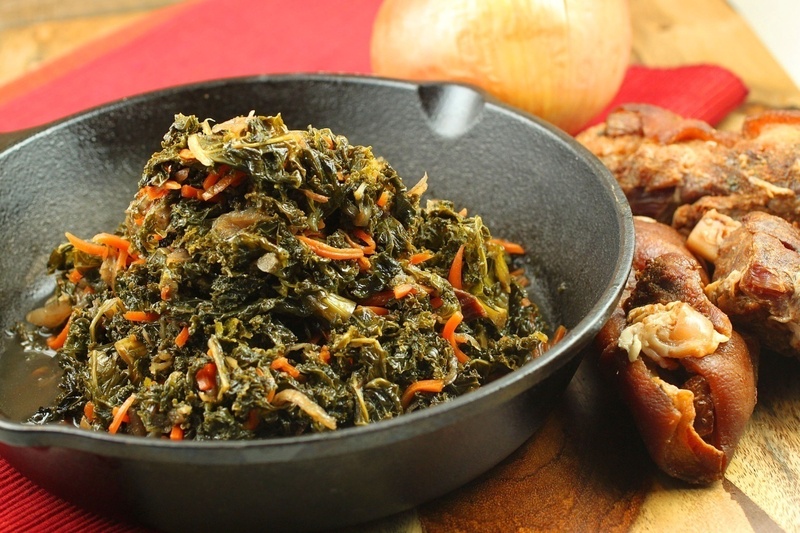 Once you have your stock base prepared, you’re ready to make your collard greens. Once the stock base is ready, find a pot big enough to cook your greens. 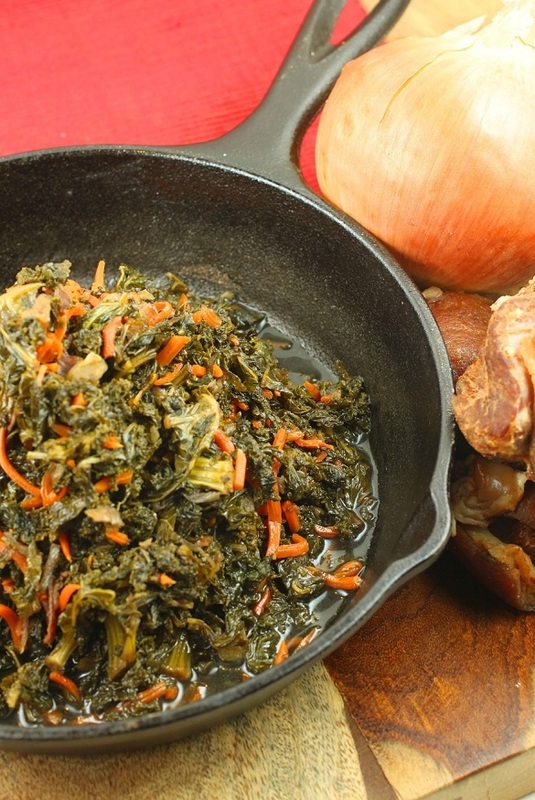 Cook the collard greens with the prepared stock. Season to taste with salt and pepper. If you like your collard greens very tender, cook them for up to an hour. If you like them a bit al dente, cook them for 15 minutes. I add the julienned carrots once my greens are tender as I like the sweetness of the carrot to balance the slight bitterness of the greens. If you don’t have carrots, you can add a pinch or two of brown sugar. Enjoy immediately or you can refrigerate it and reheat the next day for better flavor.